It was in 1958 that the propagation of the Fatima Apostolate of the Blue Army started in the Philippines particularly in Mangaldan, Pangasinanwith the team of Bro. Francisco Rosario (+ 1969) and Mrs. Filomena de Guzman (+ April 14, 2013). However it was only on May 13, 1960 that the first Blue Army Chapter in the Philippines was organized in Mangaldan with Mrs. Filomena de Guzman as its President. 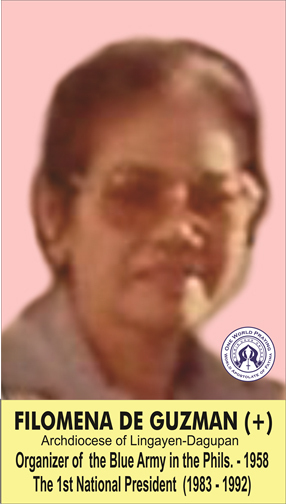 On October 28, 1967, Mrs. De Guzman was elected the first Archdiocesan President of the Blue Army in the Archdiocese of Lingayen-Dagupan and was re-elected on December 10, 1974. 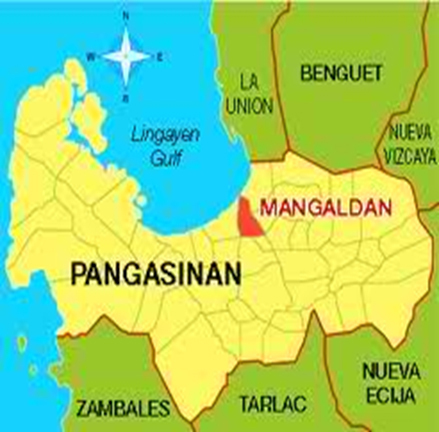 It was only after more than twenty (20) years, since the organization of the first Blue Army Chapter in Mangaldan, Pangasinan, that the Blue Army was officially organized in Cebu City, the Queen City of the South, on August 16, 1980 (a Saturday) at the basement of Santo Rosario Parish Church which was then undergoing renovation. The Cebu Chapter of the Blue Army was separately organized through the efforts of theCebu Carmelite Sisters and Rev. Fr. Ramon Ofredo, a Third Order Carmelite, and the prompt response of Antonio II “Boyie” O. Mansueto. On April 24, 1983, during the First National Convention of the Blue Army in BonuanGueset, Dagupan City, the National Organization was formally organized with Mrs. Filomena G. de Guzman as the first ever National President and Engr. Antonio II O. Mansueto as the first ever National Lay Delegate. The late Archbishop Federico G. Limon was elected National Spiritual Director. Mrs. De Guzman was re-elected on May 1-2, 1987 at the 2nd National Convention also in Bonuan, Gueset. The term of office for the national officers was then four years, i.e., from 1983 to 1987. In March 1986, the Blue Army in the Philippines became officially known as the World Apostolate of Fatima (The Blue Army) of the Philippines in accordance with a suggestion of the Pontifical Council of the Laity in Rome to change the official name of the apostolate to World Apostolate of Fatima (The Blue Army). The WAF Philippines National Center was then transferred to Valenzuela from Mangaldan, particularly at the National Shrine of Our Lady of Fatima. This was decided by the WAF National Council during its National Convention held in Cebu City. The National Convention held at the National Shrine of Our Lady of Fatima from May 1-2, 1992 saw the first change of command with the election of Engr. Antonio II “Boyie” O. Mansueto as the second National President for a term of three (3) years only. He was re-elected at the National Convention in Cagayan de Oro City on May 27-30, 1995 for a term of two years only (i.e., from 1995 to 1997) per the 1996 Amended WAF National Constitution and Bylaws. Engr. Antonio II “Boyie” O. Mansueto, representing the WAF Philippines as its National President, participated in the International Symposium on Fatima held in Fatima, Portugal. This was part of the celebration of the 75th Anniversary of the Fatima Apparitions on October 13, 1992. On May 29, 1993, Feast of Mary, Queen of Apostles, a new WAF National Constitution and Bylaws was adopted during the National Convention held in Cagayan de Oro City instituting streamlining of the organization. The WAF Philippines held the first Youth National Convention in Cebu City from August 26 to August 29, 1993. This saw the birth of the WAF Philippines’ Second Organizational Division (according to Age Bracket), the Youth Apostolate of Fatima of the Philippines (YAF Philippines), which was formally organized on August 27, 1993, Feast of St. Monica. Miss Anita C. Amaya of Cebu City was elected as the First YAF National President. On October 13, 1993, the International Executive Committee (COMEX) of the World Apostolate of Fatima approved the request of the Philippines to bury its Pledges in the country instead of sending them to Fatima, Portugal. On February 20, 1994, the 70th Death Anniversary of Jacinta Marto, the WAF National Center was formally opened at the National Shrine of Our Lady of Fatima with Msgr. Edgardo Villacorteblessing the Center and Bro. Epifanio R. Galinato, later to become the WAF National President, taking his oath of office as the National Center Head before Engr. Antonio II O. Mansueto, the WAF National President at that time. The first ever National Threefold Course for WAF Seminar Speakers was held every day for four (4) alternate weeks from April 4 to May 21, 1994 in the Mother of Our Redeemer Parish Hall in Cogon, Ormoc City. 4) WAF Training Course for Seminar Speakers – Part 2 [May 16 to 21, 1994]. This National Threefold Course for WAF Seminar Speakers was conducted by the WAF National Trainors, Sis. Nida Ruiz and Bro. BoyieMansueto,and was attended by twenty-nine (29) trainees, outstanding WAF Leaders coming from the Visayas and Mindanao. Those who persevered in this very challenging four-week course were commissioned as Official WAF Seminar Speakers on May 22, 1994, the culminating day. On October 13, 1995, the first burial of WAF Pledges in the Philippines was held at a specially-built burial place at the Chapel of the Saints of the National Shrine of Our Lady of Fatima. The Children Apostolate of Fatima of the Philippines (CAF Philippines) was formally established as the Third Organizational Division (according to Age Bracket) of the WAF Philippines through a Resolution sponsored by Bro. 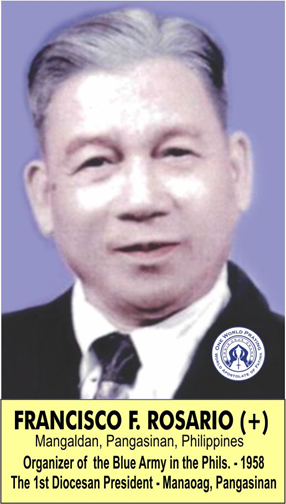 Epifanio R. Galinatoduly approved by the delegates on May 27, 1995 during the National Convention of the WAF Philippines in Palo, Leyte. and Archbishop Angel N. Lagdameo(then the Bishop of Dumaguete and Chairman of the Episcopal Commission of the Laity of the Catholic Bishops Conference of the Philippines or CBCP) was designated as the 2nd WAF National Spiritual Director. The National Convention held at the Immaculate Conception Seminary, Guiguinito, Bulacan saw the second change of command with the election of Bro. Epifanio R. Galinato of Valenzuela City, Diocese of Malolos, as the 3rd National President of the World Apostolate of Fatima of the Philippines. He was reelected at the National Convention in Malaybalay, Bukidnon on May 13-16, 1999 and in Tagaytay City on May 24-27, 2001. May 13-16, 1999: First Joint Biennial National Convention of the WAF, YAF and CAF Philippines in Malaybalay, Bukidnon. The WAF National Convention held from May 24-27, 2001 in Tagaytayadopted the Alleviation of Poverty through formation of cooperatives as a program in line with the thrust of the Church as the “Church of the Poor”. Later the Fatima Apostolate Cooperative Movement of the Philippines (FACM Philippines) was adopted by the EXCOM as a program vehicle of the Apostolate. Fatima Apostolate Cooperative Movement (FACM Philippines), namely, the Fatima Apostolate of Valenzuela Multi-Purpose Cooperative (FAVMPCO) was registered with the Cooperative Development Authority. The EXCOM at its meeting in Cebu took note of the decision of the International Board of Trustees of the World Apostolate of Fatima during its meeting at DomusPacis, Fatima on November 6-9, 2001 to drop the name Blue Armyfrom the title of our Apostolate in accordance with a directive of the Vatican. The Fatima Apostolate Learning Center System of the Philippines (FALCS Philippines) was approved by the EXCOM as a program of the Apostolate at its meeting in Cagayan de Oro City. The May 27-30, 2003 WAF National Convention at Jaro. Iloilo City saw the third change of command with the election of Sis. Nida M. Ruiz of Cebu as the 4th National President of the World Apostolate of Fatima of the Philippines. She was reelected at the National Convention in Baguio City in 2005 and in Cagayan de Oro City in 2007. The Fatima Apostolate Learning Center of Valenzuela (FALC Valenzuela) was formally inaugurated as the first learning center of the FALCS Philippines. For the first time since it was accepted as a member of the SangguniangLaikongPilipinas (SLP) in 1995, the WAF Philippines joined the elections for the members of the Board of Trustees of the SLP. Mr. Epifanio R. Galinato was elected representing the WAF Philippines in the SLP Board for a term of two years, 2003-2005. On October 24, 2004, the Association of Fatima Apostolate Cooperatives (AFACOP), which grouped together the Fatima Apostolate Cooperatives (FACS), was formed during the meeting of the WAF EXCOM held in Dagupan City, Pangasinan. The WAF Philippines participated at the International General Assembly of the World Apostolate of Fatima held from November 22 to 26, 2004 at the DomusPacis in Fatima, Portugal. It was represented by Sis. Nida M. Ruiz, National President, and Bro. EpifanioGalinato, National Consultant and Chairman of the National Advisory Board of the Children Apostolate of Fatima of the Philippines (CAF Philippines). On November 22, 2004, the Philippines, through Sis. Nida M. Ruiz, signed the amended WAF International Statutes during the International General Assembly at the DomusPacis that would make the WAF a “Public Association of the Faithful” upon its formal approval and announcement by the Pontifical Council of the Laity. The WAF Philippines was the host of the First Asian Congress of the World Apostolate of Fatima held from August 21 to 24, 2006 at ECOTECH Center in Lahug, Cebu City. The WAF International Board of Trustees agreed to adopt the Formation Program of the WAF Philippines in order to share them with many WAF Nations in the world. The WAF Philippines attended the International Fatima Congress held at Pope Paul VI Convention Hall in Fatima, Portugal represented by Sis. Nida Ruiz, National President and Member of the WAF International Board of Trustees. The WAF Philippines participated at the WAF International General Assembly held in DomusPacis in Fatima, Portugal as represented by Sis. Nida M. Ruiz, National President and Member of the WAF International Board of Trustees, Rev. Fr. Reynald “Rey” Evangelista, WAF Spiritual Director of the Diocese of Talibon (Bohol) and Rev. Fr. Miguelito “Mike” Fortich, Parish Vicar of Santo Rosario Church in Cebu City as official observer. Sis. Nida M. Ruiz, WAF Philippines National President, was re-elected on November 19, 2008 (her birthday) as a member of the WAF international Board of Trustees. 3) CAF Philippines for its 14th Anniversary (founded on May 27, 1995). The joint national celebration was held at the SPFY Covered Court in the Cebu Archbishop’s Residence in D. Jakosalem St., Cebu City. The WAF National Convention held from May 21-24, 2009 in the Archdiocese of Palo (Tacloban City, Leyte) saw the fourth change of command with the election of Bro. Nelson M. Tandingan of Mangaldan, Pangasinanas the 5th National President of the World Apostolate of Fatima of the Philippines. Delegates from the WAF Philippines attended the Second WAF Asian Regional Congress held from September 10-13, 2009 at Nam GuUam 2 Dong 124, WAF Center, Pusan City, Korea. Sis. Nida M. Ruiz, the Immediate Past WAF National President, became the second WAF Philippines National Officer to be elected to the Board of Trustees of the SangguniangLaikongPilipinas during its 16th Biennial National Convention held at the University of the Assumption in San Fernando City. Sis. Nida M. Ruiz of WAF Philippines, as member of the WAF International Board of Trustees, attended the first meeting of the newly-elected WAF International Board of Trustees held at DomusPacis in Fatima, Portugal as well as the Vespers with priests, religious, seminarians and deacons and the encounter of organization-members of the Social Pastoral Ministry with Pope Benedict XVI in the Most Holy Trinity Church at Fatima, Portugal. These all took place at Fatima from May 10-15, 2010. The International Pilgrim Virgin Statue (IPVS) sanctioned by the Basilica of Our Lady of Fatima in Portugal started her Official Visitation in the Philippines, as sponsored and coordinated by WAF Philippines, on July 1, 2010 at St. Andrew Cathedral Church in the Diocese of Parañaque, Metro Manila and ended in the Archdiocese of Cebu before it headed back to Portugal on October 14, 2010. Out of eighty-five (85) Arch/Dioceses in the Philippines, only 24 Arch/Dioceses mostly with organized WAF Divisions were visited by the IPVS. The Official Pilgrim Virgin Visitation was coordinated by the Accompanying Team of the WAF Philippines which consisted of the WAF National Officers and the religious brothers of the Society of the Angel of Peace (S.A.P.) [founded by Msgr. Cristobal E. Garcia, S.A.P., H.P., the former WAF Spiritual Director of the Cebu Archdiocesan Division and the Central Visayas Regional Division]. Aside from the 24 Arch/Dioceses, three additional dioceses were visited, namely: the Archdiocese of Lipa (Batangas), the Diocese of Cubao (Quezon City) and the Diocese of Parañaque (Metro Manila). Our Lady in her International Pilgrim Virgin Statue returned to Fatima, Portugal on October 14, 2010. She was accompanied by the WAF National President, Bro. Nelson M. Tandingan; the Immediate Past WAF National President and WAF National Consultant, Sis. Nida M. Ruiz; the fomer WAF Spiritual Director of the Cebu Archdiocesan Division and the Central Visayas Regional Division, Msgr. Cristobal E. Garcia; the Archbishop of Lipa, Most Rev. Ramon Arguelles, D.D. ; and some Marian devotees from the Archdiocese of Cebu. The WAF National Convention held from May 19-22, 2011 in the Diocesan Formation Center in Impalambong, Malaybalay City (Bukidnon) saw the fifth change of command with the election of Bro. Reynald “Rey” F. Andalesof Cebu as the 6th National President of the World Apostolate of Fatima of the Philippines. The WAF National Council meeting in the aforesaid convention made some important amendments of the WAF National Constitution and Bylaws particularly the May 21, 2011 Election of the WAF National Formation Coordinator whose main task is to put into continual realization of “Formation as WAF’s Top Priority” in the WAF Philippines. In line with “Formation as WAF’s Top Priority”, the WAF Basic Formation Program was officially approved by the National Council meeting on May 21, 2011 in Malaybalay. 7) WAF Angels’ Time for Ministry (ATM) Seminar. The 19th Biennial WAF National Convention was held from May 23-26, 2013 in the St. Francis de Sales Major Seminary in Maraouy, Lipa City, Batangas. Bro. Reynald F. Andales was re-elected as WAF National President for 2013-2015 for his second term. The IPVS made its second official visit to the Philippines from September 16, 2013 in the Archdioceses of Manila to December 20, 2013 in the Archdiocese of Cebu. The demise of the late Nida Ruiz (+) left her seat in the International Board of Trustees vacant. This led to the appointment of Reynald Andales, WAF National President to replace her as unanimously voted upon by the WAF International Board of Trustees.